As we mentioned in our earlier post on Czech Easter traditions, the end of this month in the old Celtic calendar was a time of spirits, magic and occult forces, the end of the old year and the beginning of the new. On April 30th, many Czechs will celebrate the pálení čarodějnic, or burning of the witches, an old tradition meant to drive away evil spirits at the time when the veil between the worlds was at its weakest, similar to many customs surrounding Halloween in the UK and US. So at this time of monsters and demons, what should you be wary of if you’re visiting the Czech Republic? What kind of creatures might you encounter, slipping through from the other side? This is perhaps the most famous Czech monster, especially if you’re visiting Prague. You’ll see his image on bookmarks, fridge magnets and t shirts and you can buy various books about the legend in the souvenir shops, including the famous version written by Gustav Meyrink. There’s even a musical based on the story. The golem, which featured in Jewish folklore long before the 16th century when the Prague story takes place, was a creature made out of clay and animated by magic. One was, according to the story created by Rabbi Judah Ben Bezalel, also known as Rabbi Loew, who was an actual historical figure in the 16th century and was a great scholar and spokesman for the Jewish Quarter in Prague at that time. In fact, you can look out for a statue of him on Marianske Namesti if you take our Charles Bridge Tour. 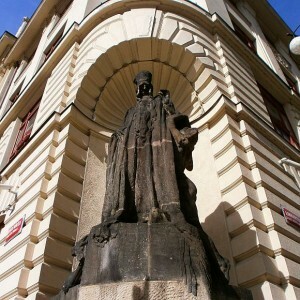 Different versions of the story claim he created the golem either to protect the Jewish Quarter from anti-Semitic attacks, or in some versions to defend the entire city against the Swedish army during the Thirty Years War, when they had occupied the west bank of the city and Prague Castle. 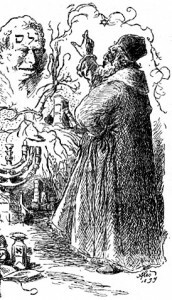 Rabbi Loew went to the banks of the Vltava River and fashioned the creature from clay, and animated it by writing the Hebrew word ‘EMET’, which translates roughly as ‘truth’ or ‘reality’ on its forehead. The golem went off on his command to protect the city but could not be stopped, and kept on rampaging through the city. Some stories say the golem fell in love, others say it turned on Rabbi Loew and began attacking Jews as well as Gentiles, but eventually the Rabbi had to act, and so he rubbed out one of the letters of the magic word on the Golem’s forehead, making it ‘MET’, which translates as ‘death’. The golem was then stored in the attic of the Old-New Synagogue in case it might be needed again. The Golem has, of course, never been found, even though several searches of the attic of the synagogue, (the attic is not accessible to the public), have been made, including one by a TV crew in 1984 and, according to another legend, one by a Nazi officer during the Second World War, but there is a story that the creature was removed in antiquity and hidden in Žižkov cemetery, and so is now buried beneath the very modern Žižkov Television Tower! This is the Czech Republic’s equivalent of the vampire, and in fact it’s used now just as a translation of the English word (you can, for instance, buy copies of L J Smith’s Vampire Diaries series here, translated as ‘Upiri Deniky’), but the Czech version of the vampire legend is a little less appealing than the Edward Cullens or the Lestat de Lioncourts of modern literature. Here, the upir was more a creature of instinct, nothing suave or charming about it. It was believed that anyone who was not buried with the correct rituals, or who had lived an ‘unclean’ life in some way, was in danger of becoming an upir. If, for instance, you had been suspected of being a witch or a heretic, people might watch your grave with a little wariness when you died, in case you came back, or even if you died with an unsettled grudge, it was possible you could rise again to try and even the scores from beyond the grave. Many of the Czech vampire stories, in fact, involve neighbours who had had a dispute, but one of the parties died. The dead man, however, can’t let the argument rest and returns, often to attack the neighbour’s cattle and therefore damage his livelihood. The upir was a blood drinker but in many versions of the story they could not stop, and would simply keep on drinking blood, human or animal, until they swelled up like a tick. Some stories claim the villagers tried to stake the upir or stab it with a sword, only to find it exploded in a shower of freshly drunk blood! The only way, in fact, to destroy an upir, was by fire, but this meant having to incapacitate the creature first, so in many cases the creature had to be hacked to pieces first before it could be set alight. This may all sound like an episode of Supernatural, but these legends were believed so much in the Czech lands that eventually it was made part of the town executioner’s job to deal with any rumours of an upir, to dig up the corpse suspected of sneaking out of its grave and causing mischief and to burn it. You can find out more about that, and some of the other miserable aspects of the executioner’s job on our Underground Walk by lamplight tour. 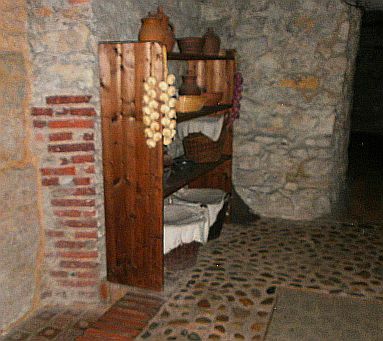 Look out in particular for the garlic hung in areas of the underground – perhaps it wasn’t just used for cooking! This is a Czech monster you might not have heard of and one you probably won’t find mentioned in any of the guidebooks. It’s a very obscure legend that arose during the Thirty Years War, and the story is found only in the Czech and Slovak Republics, and in a few areas of Germany. The Fekst (or Fext in German) were born with two skins. One was removed immediately after birth so that no one would know the child was anything supernatural, but the mother would always roll up the extra skin and sew it into the child’s armpit, so that he or she could still benefit from its magical properties. This extra skin gave the person extraordinary healing powers and near immortality. They could not be injured or killed by normal means and would recover very quickly from illness. People, therefore, who had particularly good immune systems or who seemed to be able to withstand a lot of pain were often suspected of being Fekst, and it seems that the stories originally sprang up in villages affected by the fighting between the Czechs and Swedes in the Thirty Years War, possibly based on soldiers who seemed to be able to take severe injuries in battle or who healed quickly afterwards. Any attack aimed at the Fekst would be repelled and returned to the attacker, so that if you tried to shoot one, your own bullet would return and kill you. The only way, therefore, to kill a Fekst was to trick its second skin and use some sort of weapon that would not normally be used in that way, so bullets made of glass, for instance, could kill it, because the skin would not think glass bullets were real weapons. Sometimes the skin’s invulnerability lasted even after the person or Fekst had died naturally, and so their bones and bodies could still move after burial. Sometimes the Fekst would rise up and prowl around the graveyard, spurred on purely by the energy of this magical second skin. It was believed that if you opened up a grave and the body had not decayed as much as would be expected, or was in a mummified state, then that person had been a Fekst and it was this magical skin keeping the remains preserved. In Osecnice, in the Hradec Kralove region of northeastern Bohemia, one story described how a magistrate of the town had gone after the Swedish army, who were camped near the town and had stolen all the local cattle to feed their troops. The magistrate fired his musket at the cattle, causing a stampede, and killing several Swedish soldiers. When the Swedes went to the town to exact their revenge, they shot at the magistrate, who was there at the fore, leading the defence of the town, but the Swedish bullets simply bounced back, killing those who’d fired them. The Swedes then came to believe that the magistrate was a Fekst. Years later, when the magistrate’s tomb was opened for another burial, out of interest they opened the coffin to see if the legends were true, and his bones were said to have rustled and moved of their own accord, with the last traces of the Fekst’s power. In Sudslava, near Pardubice, a legend says a local man who had fallen on hard times took to robbing graves in the local cemetery, and happened to pick up a bone he found lying on the ground near an old, decaying tomb. This bone, however, belonged to a Fekst, and the rest of the mummified body rose up from the grave to chase the robber, leaping onto his back and clawing at him to get its remains back. The robber could not prize off the creature and in the end threw away the bag of loot he’d found, including the bone, which luckily persuaded the Fekst to let go and chase after its remains instead. The story doesn’t say what happened to the thief afterwards, but it’s unlikely he tried his hand at graverobbing again! Our final Czech monster tonight is the Vodnik (plural vodnici), a water spirit, which was not necessarily evil but not something you’d want to cross either. They were not inherently evil, but some disliked humanity more than others. They tended to live in ponds and rivers, and were outwardly quite human, except for a greenish tint to their hair and skin, webbed hands and feet, and sometimes gills as well. They tended to dress like tramps, in patchwork clothes and with straw hats decorated with ribbons. Many had long, tangled beards and were usually dripping wet, even after hours out of the water. If one was not particularly fond of humans or territorial about its pond, it might drown swimmers and bathers. They would then keep the souls of those drowned people in little china pots, and the number of souls collected was seen as a status symbol amongst the vodnici. If the lid of the pot was removed, however, then the soul would escape. But the vodnici could also be benevolent, often just sitting on the banks of the pond or river smoking their pipes, playing cards or lounging in willow groves by the water’s edge. They could be persuaded, with a bribe of some tobacco left on a rock by the pond or riverside, to help fishermen, by sending fish their way. So as you can see, it might not just be witches you need to look out for if you join us in Prague over the next few weeks. Make sure if you join our tours that you have your cameras ready, as you never know what sort of monster you might catch!